It was almost 2 weeks ago when, come back from my coffee hopping afternoon dedicated to menu developing, I found this tweet from my friend Jamie (lifesafeast): “@mowielicious @RecipeTaster @sippitysup @glamah @DailySpud @MeetaWFLH Hop over to my blog to collect your awards!”. On doing as directed, I found this. • Meeta of What’s For Lunch Honey? I was pretty excited at the news, it is the first award my blog receives and coming from a competent friend like Jamie feels like receiving a gold medal with the national anthem playing in the background! I am very glad to have decided to have joined Twitter and so to have met such wonderful friends. We are even meeting up in London this weekend, so much looking forward to it! They are incredibly inspirational and supporting. It is nice to have such an audience helping you growing with their comments and suggestions. Since we are talking about awards, on my last trip to Paris I finally managed to fetch the prize I was awarded at the 4th edition of the Rencontres Science Art et Cuisine (http://www.sciencesetgastronomie.com/concours/4-modernitetradition.htm) past April (read my previous post on it http://recipetaster.blogspot.com/2009/04/and-winner-is.html). 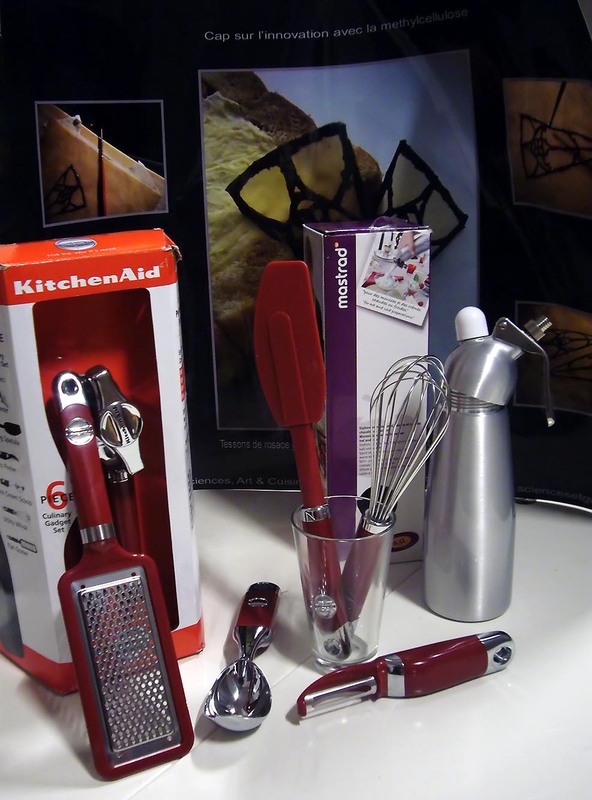 I was told that I got as prize a whipped cream canister but when there Mme Renaudine gave me also a nice red box bearing the “Kitchen-Aid” logo on it. 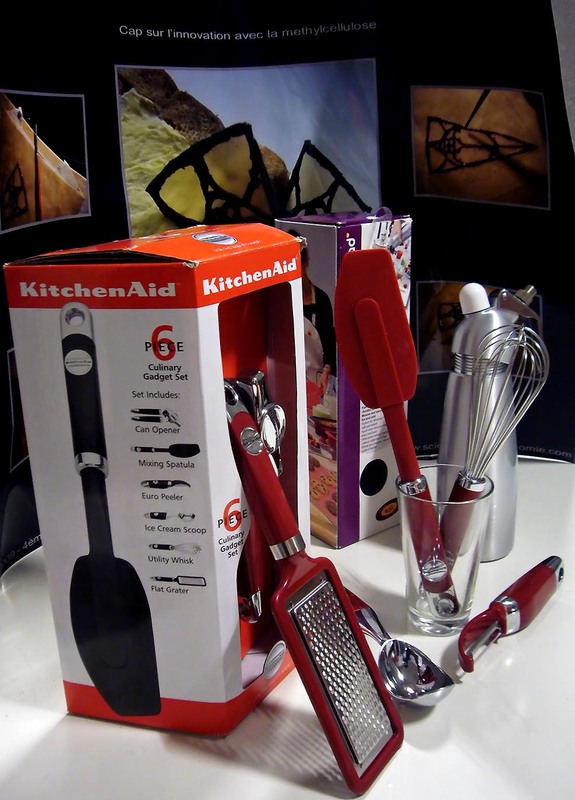 It was a set of 6 kitchen utensils featuring a can opener, a whisk, a spatula, vegetable peeler, fine grater and an ice cream scoop each of them in a nice dark red (as my kitchen walls). Aren’t they nice?? So much for “concrete” prizes, I still cannot get enough appreciations and smiles from the guests attending my dinners. Those really charge you up! Lovely to meet you on Saturday & chat over dinner! Those of us in London really should get together more often. Also - just had a "six degrees of separation" moment: You passed this meme on to Glamah... and she passed it on to me!